Pumpkin is one fruit that has so many uses that you cannot list them all on one page. It is used as a fruit to prepare breads, cakes, cheesecakes, puddings etc. and it is used as a vegetable to prepare exciting gravy dishes. I like pumpkin bread recipe the best, so here is my favorite pumpkin bread recipe healthy and easy to make. – Soak the almonds in water overnight. – Peel in the morning and thinly slice the almonds. – In a bowl, take the eggs and sugar and whisk them until fluffy. – Add the brown sugar. – Add the zucchini, pumpkin and vanilla. – Blend well to get a smooth mix. – In a dry bowl, mix the flour, cinnamon, nutmeg, cloves, baking powder and baking soda. – Add the dry ingredients to the egg-zucchini mix using one tablespoon at a time. – Blend well to get an even mix. – Stir in the raisins and sliced almonds. – Grease two bread loaf pans. – Pour the batter in the loaf pans equally. – Bake in the preheated oven for about 45 to 50 minutes or until a toothpick inserted in the middle of the bread comes out clean. – Remove from the oven and cool in the pan for 10 minutes before inverting on a wire rack to cool completely. – Cut in slices to serve. – Use the above instructions to bake the bread. Pumpkin bread freezes well so you can easily make batches and store in your freezer to defrost when needed. – Beat the egg to fluffy. – Add the milk and beat some more. – Add the vanilla, cinnamon and all spice. – Melt a little butter on a skillet. – Dip the bread in the egg batter. – Place on the skillet and cook on both sides until nicely browned. – Serve with maple syrup and cream. A microwave is a great friend when you are in a hurry and do not have the time to stand in front of the stove. Using a microwave cuts down the cooking time and effort greatly and you do not have to use as much oil. I especially love the desserts such as bread pudding recipe that I can make in the microwave as it cuts down the waiting time a great deal. 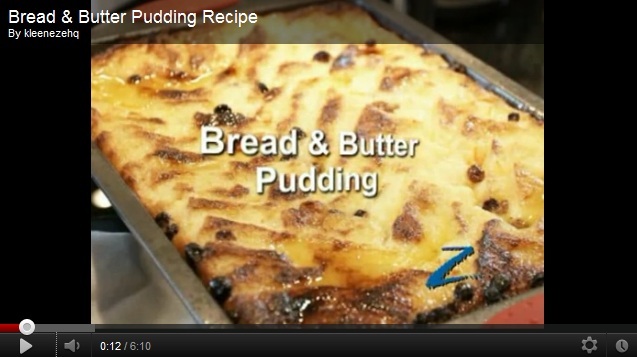 Here is my favorite microwave bread and butter pudding recipe easy and tasty. – Butter the bread slices on both sides. – Cut the slices diagonally to get 4 small triangles (you can cut in large cubes but triangles are more traditional). – Grease a 7x7x5 inch glass microwave dish. – Line the bread slices on the bottom of the dish. – Sprinkle the nuts on the top of the bread. – Sprinkle muesli on the top. 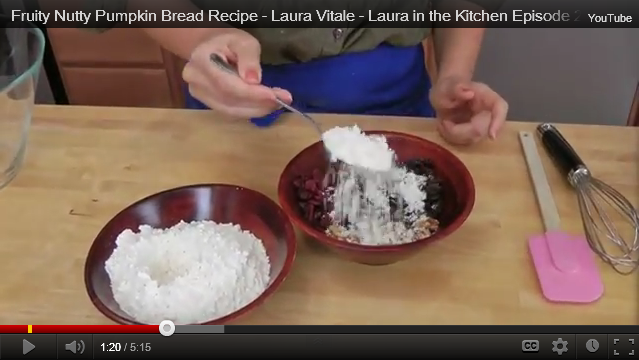 – In a separate bowl, whisk together 3/4 cup of milk, sugar, vanilla, cream and dried raisins. – Once the sugar is mixed, let the mix sit for 2 minutes. – Mix the rest of the milk (1/4 cup) with the corn flour in another bowl. – Pour the corn flour mix in the cream-sugar mix and whisk well to get an even custard mix. – Gently pour the custard in the microwave dish from the side. Don’t pour on the top of the bread. – Sprinkle the brown sugar on the top. – Let the dish sit for 5 minutes. – Microwave on high for 2 1/2 minutes. 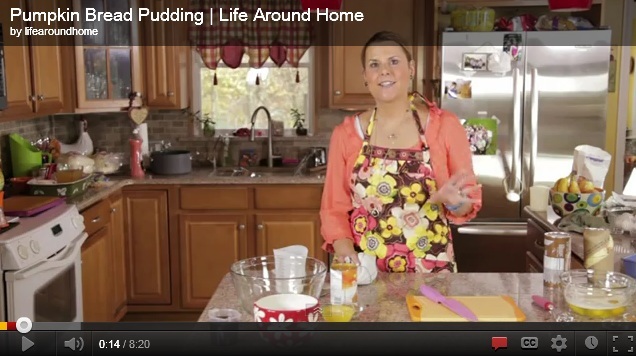 – Let the pudding sit for 10-15 minutes, serve warm. Note: If you are going to use more slices of bread then increase the microwave time (8 minutes for 4 thick slices). – Melt 85 grams of cooking chocolate in the microwave. Spread the melted chocolate over the sliced bread before adding the muesli and you can enjoy the delicious chocolate taste. – Add some cinnamon to the custard for more flavors. – Experiment with different kinds of breads such as brioche bread, crusty bread croissant etc. – Serve the bread with whipped cream and cherries on the top for an exotic look. – There are no eggs in the recipe and therefore it can be easily served to vegetarian guests. Not every type of bread has to be fattening and heavy. And you don’t have to spend extra money to buy ‘low fat’ products in the bakery. 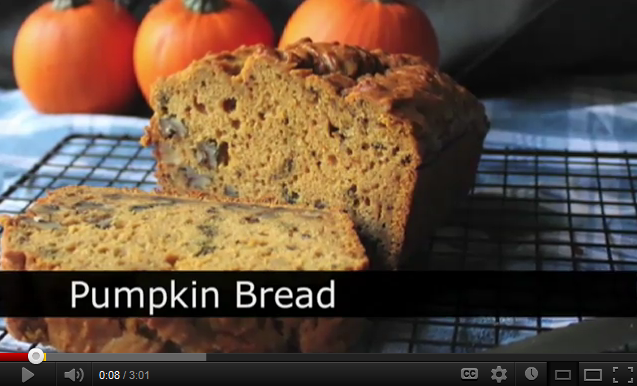 You can easily make tasty, healthy and simple pumpkin bread recipe at home. In my quest to work out healthy recipes using fresh ingredients, here is a simple healthy pumpkin bread recipe that you must try at home. – Grease and flour two 9×5 inch baking pans. – In a dry bowl, measure the flour, baking soda, ground cinnamon, ground nutmeg, all spice powder and baking powder. Mix all the dry ingredients thoroughly. – In a separate bowl, take the pumpkin and water and blend them on a low speed to get a smooth puree kind of consistency. – In a third bowl, take the eggs and egg replacer and blend them at medium speed to get a fluffy mix. – Add the oil and buttermilk to the eggs and blend at medium speed to mix well. – Pour the pumpkin puree in the egg-buttermilk mix and blend at high speed for 1 1/2 minutes. If you blend too much then the pumpkin can turn sticky and spoil the texture of the bread. – Now add the dry ingredients to the pumpkin–egg–buttermilk mixture and blend at low speed until just combined. – Pour the prepared bread batter in the greased bread loaf pans. – Sprinkle the chopped walnuts or pecans on the top. – Bake the bread in the preheated oven at 350F for 50 minutes. – Cover the bread with silver foil and bake for another 10 minutes. – Remove the bread from the oven and cool in the pan for 10 minutes. – Remove from the pan and cool on a wire rack. This bread can be wrapped in plastic wrap and stored in the freezer for one month. Buttermilk can be easily made at home. – Stir the lemon juice in the milk. – Let it sit for 10 minutes. – Stir again and your buttermilk is ready to use. Colours are the life of India and it reflects in Indian food. Colorful spicy food is the mark of Indian food. 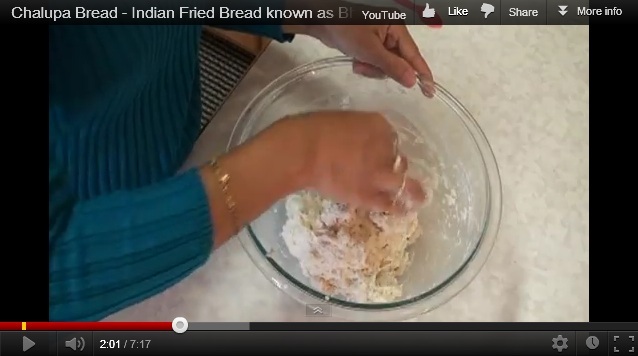 Gravy dishes, fry bread recipe and sweets all form part of the Indian cuisine. To tempt your taste buds, here is a spicy and green Indian fry bread recipe that can be served as a snack or with gravies as a meal. – Take 400 grams of flour in a bowl. – Heat the ghee over a medium flame and pour it over the flour. – Gently rub the flour between your fingers so that you get a crumbly sort of mix. – Add one tablespoon of salt to the dough and mix some more. – Add the carom seeds and yogurt to the mix and gently knead the dough to a stiff mix. – Sprinkle a little water on the dough and keep on kneading to get a smooth, soft dough. – Cover the dough and set aside. – Boil the peas until soft. – Remove from the heat and drain. Let them cool a little. – Give the peas a whirl in a mixer to lightly crush them. – In a frying pan, take a little oil and add the green chilies and cumin seeds to the oil. – Fry for a minute and add the garam masala. – Add the crushed peas, dried mango powder and 1 tablespoon of salt to the oil. – Mix well and sauté for a few minutes until the mixture is dry enough to make soft balls. – Remove from the heat and cool the mix. – Divide the dough into small balls. – Roll the dough out to small 3-inch rounds. – Place 1 1/2 teaspoons of the pea mixture in the center of the rolled out dough. – Gently lift the edges of the dough and close it over the filling. – Sprinkle with some dry flour. – Lightly roll out the dough again into thin rounds. – Take care that the filling does not spill out. – Heat the oil for frying on medium heat and deep fry the bread in the oil. – Serve hot with tamarind and sweet and sour sauce. You can vary the amount of chili according to your taste. The bread also tastes good with a tomato sabzi (cooked tomatoes in gravy). I love the sweet and slightly tangy taste of pumpkin in my mouth. Out of all the sweet pumpkin recipes, I like the pumpkin bread pudding recipe it’s the best. Here is my favorite pumpkin bread pudding recipe with smooth caramel and pecan sauce. – Slice the bread loaf in the middle and cut the bread into 1-inch pieces. – Take the eggs and sugar in a large bowl and whisk well to mix. – Take the pumpkin from the can and make a puree out of it by blending in a mixer. – Add the pumpkin puree to the egg–sugar mix. – Mix well. You can use very small pumpkin pieces also, but I find that they don’t blend that well. – Add the half and half, ground cinnamon, ground nutmeg, salt and vanilla and mix all the ingredients well. – Add the bread pieces to this mix and gently stir in to coat evenly. – Cover the bowl with plastic wrap and chill in the fridge for 8 to 24 hours. This will ensure that all the ingredients are soaked up by the bread completely and the spices are well blended. – When you want to bake the pudding, preheat the oven to 350F. – Grease 11 ramekins (of 200 ml capacity each). – Spoon the soaked bread mixture in the greased ramekins. – Bake at 350F for about 35 minutes. – After 35 minutes, cover with aluminium foil and bake for another 15 minutes. – You can prepare the sauce in the meantime. – Toast the pecans over low heat. Make sure that you stir the pecans often to avoid burning. – In a saucepan, take the brown sugar, butter and corn syrup and heat them over low heat. Once the sugar dissolves, stir all the ingredients well. This should take about 5-7 minutes. – Remove from the heat and add the vanilla and pecans. – Remove the pumpkin bread pudding from the oven and drizzle the prepared sauce over the pudding. – Bake in the oven for another 5 minutes or until the sauce is bubbly. – Remove and serve in the ramekins with whipped cream on the side.